A 45-acre paradise transporting guests to tropical Islands with white-sand beaches, palm trees and those scoundrels we all know and love -- pirates. Disney has completely overhauled the food and drink options at its Caribbean Beach Resort - find out what we thought of the new table service restaurant. The new additions to Disney's Caribbean Beach Resort are now included on the latest resort guide-map. 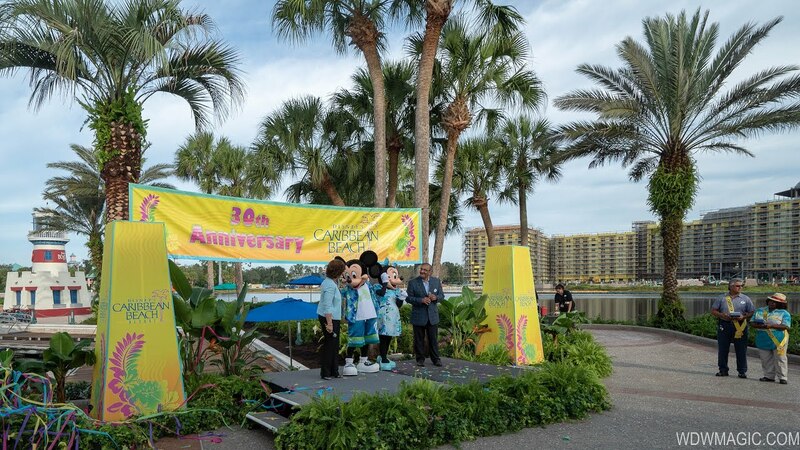 Watch as Disney's Caribbean Beach Resort marks its 30th anniversary with the help of Mickey and Minnie. 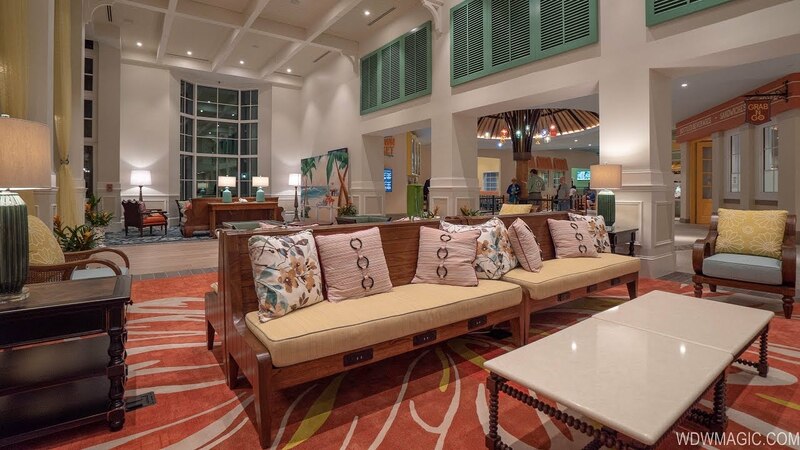 Disney's Caribbean Beach Resort has a new lounge and pool bar. We stayed at CBR for a few nights in January of 2015. It was great. Before you get too caught up in the "disappointed" reviews, know this: many (possibly all?) rooms have now been nicely renovated and there is nothing to worry about. I did some research before going, and found out which buildings had been renovated up to that point. Based on other reviews I read, we chose to stay in the "Aruba" section, and were very happy with that choice. Aruba was not the closest nor the furthest "island" from the central area with the food court/restaurant/main pool. If anybody of average health tells you it's a "long walk" from Aruba, I don't know what to tell you. It's not. We are in our 40's with minor back issues and it was always a nice little walk. We figured we could use a little exercise with all the extra eating! Shutters, the restaurant, was also better than expected. I read a lot of "mediocre" reviews, so maybe my expectations were low. We were very happy with everything we ordered. (They are only open for dinner, btw.) The server was an absolute sweetheart and the banana cocktail was fab-u-lous! ...which brings me to Banana Cabana, the pool bar. Very friendly bartenders, we had some nice conversations, and typically ended our nights there. I liked that relaxed atmosphere better than some of the indoor bars at other resorts. For perspective, we have also stayed at 2 other moderate resorts: the Coronado and POR. We like them all for different reasons, but we agree we had the most fun time at the Caribbean Beach Resort, and that is why we chose to book it again for our upcoming trip in just 2 days. (I seriously can't wait to get another one of those pulled pork sandwiches!) Should anything be different this time, we'll post an update or another review. The only downsides for us, I will agree with other reviewers, would be the bus system and also the odd check-in procedure. You have to go to a completely separate building, not exactly that close to the actual resort, in order to just check-in and do nothing else. Whereas, with most hotels you would do this in the lobby. Since it was our first time there, we didn't realize we could have walked from there (but that actually IS kind of a long, meandering walk) and so we waited for the in-resort bus to take us from the check-in building to our building area. On the night we left, we kind of forgot about that part LOL. We made a reservation at Shutters for the last night, thinking that would make it easier to get the Magic Express, rather than trying to rush back from a park or other resort. When we were almost done with dinner, we realized we had to get back to that other building (quickly) to get the Magic Express. Our waitress explained how to walk there, but it was not a direct route and we could have easily gone the wrong way LOL. And the buses to the parks...there can be a decent wait, and many stops before you leave the resort. Once we waited a very long time to go from one of the parks back to the resort. But honestly, I think if we were flying (and therefore subject to the bus) and assuming all pricing for other moderates were comparable, we'd stay at one of the other resorts for that reason alone. (We like to try all different ones anyway.) When we drive up, CBR is the way to go. Recommended without hesitation. We've staying at CBR four times over the years and it never disappoints! The tranquil atmosphere is so nice after a busy day in the parks and despite traveling at busier times, we've always felt like the resort was quiet (Old Port Royale and feature pool excluded). My kids adore the pool and the food court with all its options. They also love to shop in the gift shop and walk around listening to the steel drum music piped in around the walking trails. Many people complain about its size, but we've never found it to be a big problem even when we've booked standard roooms. "Just Plain Nice." 4 years ago by Gene L.
We have stayed here 3 times and never had any complaints. From the staff at check in to check out, house keeping and wait staff everything has been just fine. I like this resort because I like to get up in the morning and walk and the walk around the lagoon is a great way to start my day while at Disney. Each cluster of buildings has their own pool, if you don't want to use the one at the Town Square. I look forward to my next stay. Villages with names like Martinique, Barbados and Trinidad surround a 42-acre lake at Disney’s Caribbean Beach Resort. Tropical birds and colorful flowers give the moderately priced hotel an island flair. “We were challenged to create the character of famous islands that people could relate to,” Chao said. “The bright colors, landscaping, slopes and textures we used reflect the local traditions and architecture of the islands.” Jamaica’s British influence is noted by the yellow and blue color scheme and Victorian style architecture; Trinidad, the “bird island,” uses browns and yellows; and Barbados, the “island of flowers,” features pinks and greens. The Caribbean Beach Resort is unqiue in that it has a totally dedicated Check in and Check out building. The Custom House, themed as a Caribbean Island government building, is accessible via the internal bus, or via the bell services buggies that take guests to their rooms. The main central location is Old Port Royale. It features the food court, Shutters Restaurant, guest services, and the main feature pool. Number of Rooms: 2,112 guest rooms in 33 2-story buildings divided into villages - Barbados, Martinique, Aruba, Jamaica, Trinidad North, and Trinidad South. Each building within a village contains 64 guest rooms. Food court resembling a bustling Market Street. Choose from a variety of favorites such as hamburgers, pizza and pasta, broiled specialties, along with desserts from the Cinnamon Bay Bakery. Table service restaurant serving American cuisine with a Caribbean twist, featuring Island Wings, smoked prime rib, pan-seared red snapper or oven-roasted jerk chicken. The pirate themed feature pool with waterfalls, water slides, shooting water canons, 2 hot tubs and more at Old Port Royale. 1.4-mile trail around Barefoot Bay. (10am-5pm): Rent a bike or surrey for a leisurely ride along the island promenade.